It is a piece of welcome news that the Bangladesh Rice Research Institute (BRRI) withtechnical support from the Philippines-based International Rice Research Institute (IRRI) has developed three new rice varieties that are capable of withstanding drought up to a month and moderate level of salinity and cold bite. The newly developed high-yielding variety (HYV) rice have been named as BRRI dhan-55, BRRI dhan-56 and BRRI dhan-57. The first two varieties are also claimed to be resistant to blast, a common rice disease in Bangladesh. There is no denying that Bangladesh loses more crops, mainly rice, due to excessive rain and flooding, which is a recurrent event. Major floods like that of 1988 and 1997 cause substantial loss of agricultural crops. Yet drought is not at all an unknown phenomenon here. It often visits the country, taking a heavy toll on the farm output and hurting the poor farmers, in particular. The droughts of 1979 and 1999 should be still fresh in the memory of many. The last one was the severest---more than four months without rain--- in 50 years. The rainfall last year was the lowest since 1995. True, Bangladesh because of its geographical location has not been the victim of too many major droughts as it happens in many African countries and also in some states in neighbouring India. But the country should remain prepared for the worst, particularly in view of the growing erratic behaviour of nature in recent times. Many countries both in northern and southern hemispheres are being recurrently affected by floods, cyclones and droughts, causing lots of sufferings to the people in general and distortions to their economies in particular. The behaviour of nature has become so unpredictable these days that a major catastrophe may descend on any country anytime. So, it is better to remain adequately prepared to face the challenging times, in terms of erratic behaviour of nature. 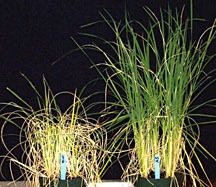 The development of drought-tolerant varieties by the BRRI, thus, can be seen as a big step forward in this context. The development of BRRI dhan-55, which is a salinity and cold-resistant variety, deserves particular attention since a vast area in the coastal districts remains fallow because of the salinity problem. If the variety can be successfully introduced, at least in moderate salinity-affected land, it would mean a lot to the people of the south eastern coastal districts, who, according to a recent World Bank study, are among the victims of disproportionate regional economic growth. The BRRI does deserve appreciation for the latest addition to the list of high-yielding varieties of rice developed by it from time to time suiting to the climate and hydrological conditions of the country. It has many glorious achievements in rice variety development. In fact, without BRRI, and to a great extent IRRI, developing so many HYV rice varieties, the country would have been in big trouble as far as its food security is concerned. The country is producing three times more rice today than four decades back despite continuous shrinking of its arable land due to construction of roads, highways, residential houses, industrial and commercial establishments and other physical infrastructures. But the agricultural scientists involved in the development of important crop varieties, unfortunately, are not getting their due recognition and patronage of the state. The government should count in terms of dollars how much money it would have required now to import the food grains had the BRRI failed to develop the new rice varieties. Hopefully, the government would extend due recognition to rice scientists and take appropriate measures to popularize the new varieties of rice developed by the BRRI.